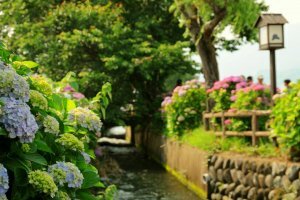 Every June, the small town of Kaisei-machi holds a wonderful Ajisai Matsuri, or Hydrangea Festival. 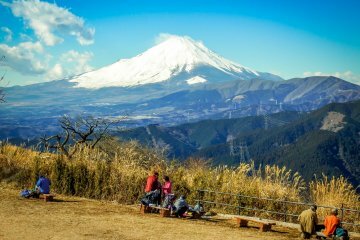 Located in the southern part of Kanagawa Prefecture, and surrounded by mountains on three sides, this countryside festival is a great choice for those who want to escape the bustle of the city without having to travel very far. 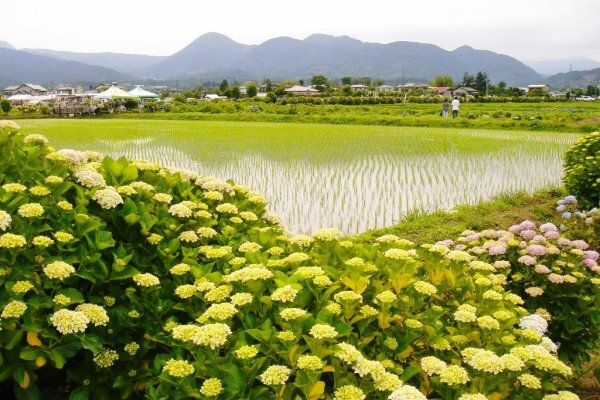 The festival is held on narrow country lanes surrounding newly planted rice paddies. 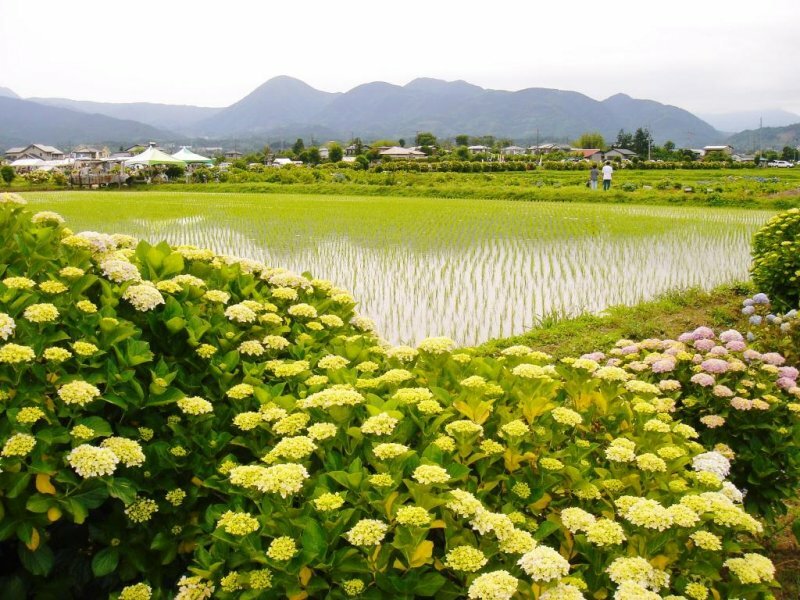 Over five thousand hydrangea bushes, in a variety of species, line the edges of these rice paddies. Colors range from deep purple, to bright pink, to pure white. An acidic or low pH causes blueness in hydrangea; a higher or alkaline pH causes pinkness. Whatever the color, the overall results are gorgeous! 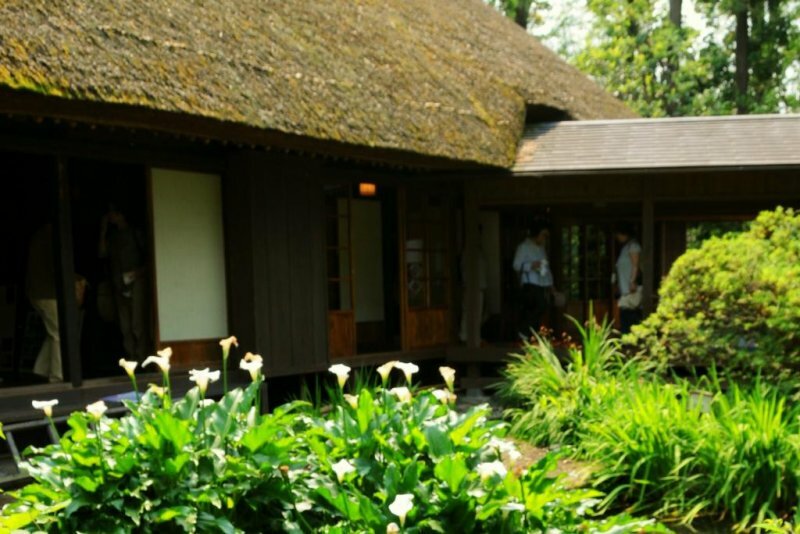 In addition to hydrangea viewing, visitors can enjoy a variety of live performances including traditional Japanese dance, tea ceremony, concerts, and taiko drumming. Children can ride on a mini steam locomotive. 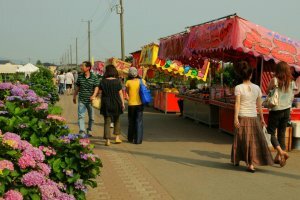 For those who enjoy shopping, there is a flea market, fruit and vegetable stands, booths selling locally made souvenirs, and more. 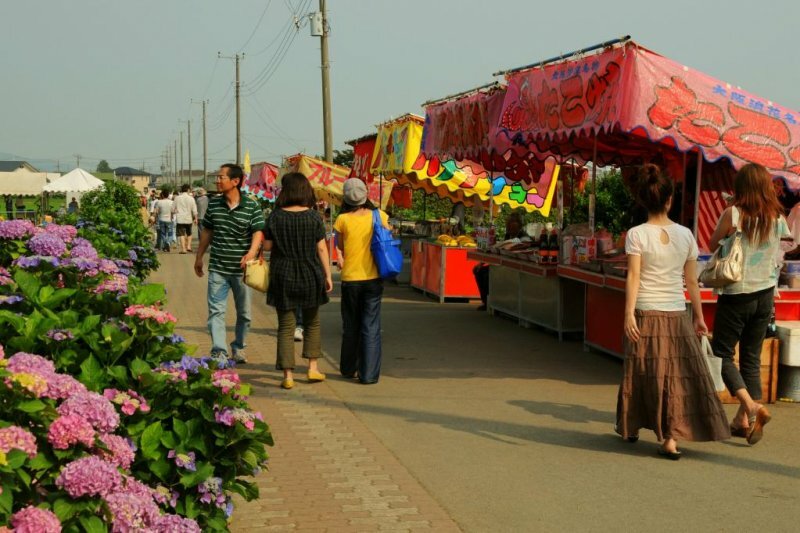 In addition, food stalls sell Japanese favorites such as okonomiyaki (savory pancake), yakisoba (grilled noodles), and kakigori (shaved ice). 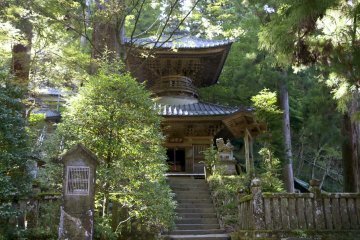 A short walk from the center of the festival is the Seto Yashiki, a 300+ year old thatched roof farmhouse that is open to the public. During the festival it is alive with activity. Visitors can enjoy art exhibits in the storehouse, weaving demonstrations, the selling of handmade crafts, and more. 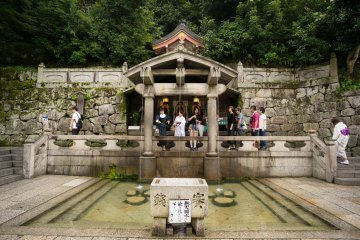 The entrance fee is 200 yen. 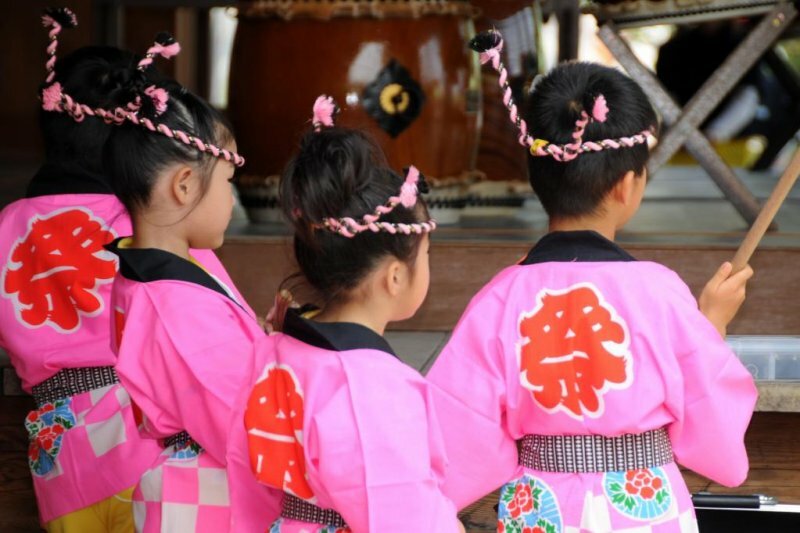 The festival usually lasts for nine days around the second week of June. 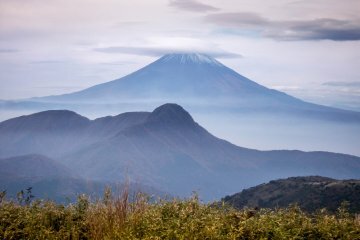 In 2013, it will start on June 8th and end on June 16. 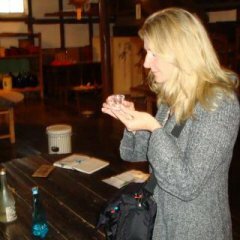 I have attended for the past 15 years, and I always have a wonderful time. 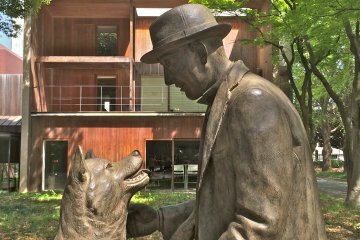 The people of Kaisei are very kind and even if they are unable to speak much English, they welcome foreign guests wholeheartedly. Always scheduled for the same dates, the town of Matsuda holds their Matsuda-yama Herb Festival. Occasional shuttles run from the hydrangea festival to the herb garden. 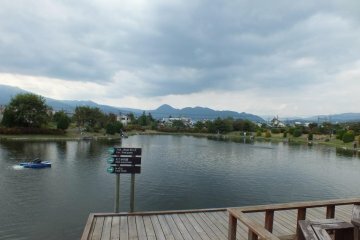 The garden is also a short walk from Shinmatsuda and Matsuda Stations. 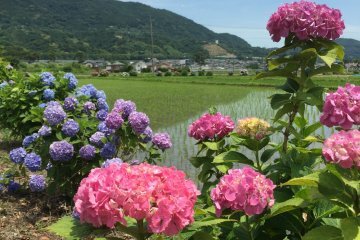 And, the city of Minami Ashigara, in an area bordering Kaisei, holds a Hana Aoi Matsuri (hollyhock festival).